Typically, any rerecorded document must be resigned and acknowledged as a new document. However, an erroneous document will not be recorded as a new document if it is presented with a corrective affidavit (Cal. Gov. Code 27201.). A corrective affidavit is a statutory device under Cal. Gov. Code 27201, used to correct a minor error in a document that has been recorded at an earlier date. Minor errors are those that, when corrected, cause no actual change in the substance of the document. Section 27201 of the Government Code states that a corrective affidavit can only be used to correct the following: an incorrect or missing return address; a clarification of illegible text; an incorrect or missing printed or typed name near the signature; or an incorrect or missing documentary transfer tax amount due. More extensive corrections to recorded documents typically require a new deed. Adding or removing a grantee, for example, or making material changes to the legal description, may all require a new document of conveyance. When in doubt about the appropriate vehicle to address the error, consult with a lawyer. A correction deed is exempt from transfer tax because no transfer is being made, and no consideration is exchanged (Cal. Rev. and Tax. Code 11911). Some counties demand a documentary transfer tax affidavit stating the reason for the exemption, to be filed in addition to the other documents being recorded, so check the county recorder's website to confirm any local requirements. 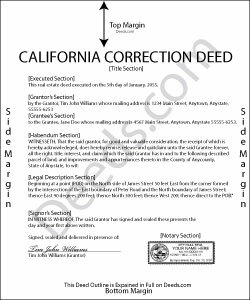 For the correction to be valid, the affidavit must be attached to the original recorded document with a cover sheet complying with Cal. Gov. Code 27361.6, stating the reason for rerecording on the cover sheet, by the person who submitted the original document for recording (Cal. Gov. Code 27201.). The affidavit itself must include the information corrected, be certified by the party submitting the affidavit under penalty of perjury, and be acknowledged pursuant to Cal. Gov. Code 27287. The affidavit can be acknowledged by any one of the officials listed in Cal. Civ. Code 1181. Finally, the form must meet all state and local standards for recorded documents. Submit the completed affidavit, along with any necessary supporting materials, to the local recording office to correct and update the public data. This article is provided for informational purposes only and is not a substitute for legal advice. Contact an attorney with questions about corrective affidavits, or for any other issues related to real property in California. Reply from Staff: Thank you Marc. Have a fantastic day! Reply from Staff: Thank you Stanley. Thomas W. said: easy to use, no problems except in beneficiary box. Need to make the box bigger because I have 4 beneficiaries to list. how do I enlarge the box. Reply from Staff: Thanks for reaching out. All available space on the document is being used. As is noted in the guide, if you have information that does not fit in the available space the included exhibit page should be used. Reply from Staff: Thank you so much Barry. Have a great day!